Many of the global sports—football, rugby, cricket, lacrosse—emerged from one ethnos (a village, a school, a “tribe”) competing against another. As wider and wider networks of players emerged, codification set in: rules and timekeeping were enforced by referees and judges. Now, when we tune in to watch a match, we no longer think of these sports’ connections to pre-industrial communities, but naturalize the leagues and governing bodies that adjudicate competition and the logos that adorn uniforms. Village affiliations have been replaced by metropolises and nations. They’re not just big sports, they’re big business. Diving is an ancient trade: there are pearl divers, sponge harvesters, and abalone fishers who from time immemorial have sought valuable quarry by going in the sea. Here, at Vertical Blue, there is barely the faintest trace of this legacy. Instead, the divers are equipped with specialized gear and technological gadgetry. During dives they are traced by sonar. In this respect they may as well be going into the atmosphere as going under the surface of the sea. So what makes it a sport? One of my neighbours at the Gems at Paradise Beach Resort, where I write this, has an imposingly thick manual of freediving on his car’s dashboard. FIFA probably has such a manual too. There is juridical authority in a manual. And there is the dramaturgical imprint of Big Sport in the ritualized competition I watched today, even though this is defied by some aspects of scale and mise en scène. Big Sport is announced by the Suunto banners that span part of the beach and bedeck the diving platform. But despite aspirations to attract sponsors, which are tangible, and notwithstanding the multinational field of divers and the legitimacy of operating under the direction of the international regulatory organization AIDA, there is more of the flavour of small-town rodeos I watched in the 1960s than an emergent sport seeking an audience. The site is accessed by a rutted sandy road. The concessionaire has a small BBQ and cooks to order. There are two small children with water-wings dashing in and out of the shallow surf. Spectators can swim out to the dive site and hang onto the square perimeter. At a small town rodeo you plant one cowboy boot on the fence rail and watch the bronc riders come out of the chute; clowns are in the arena to distract the animal away from its (inevitably) thrown rider; a timekeeper clocks the seconds and a judge posts the scores. Hey, I think I’ve seen all this before. The athletes (or are they performers? competitors? participants? executors?) have a perceptible preparatory period. They must check in at least an hour before their appointed dive time. Most are there longer. One was twenty minutes late, and the yellow-shirted judge made a “kill” sign across his throat; after a muffled protest the thwarted diver headed back to the parking lot. 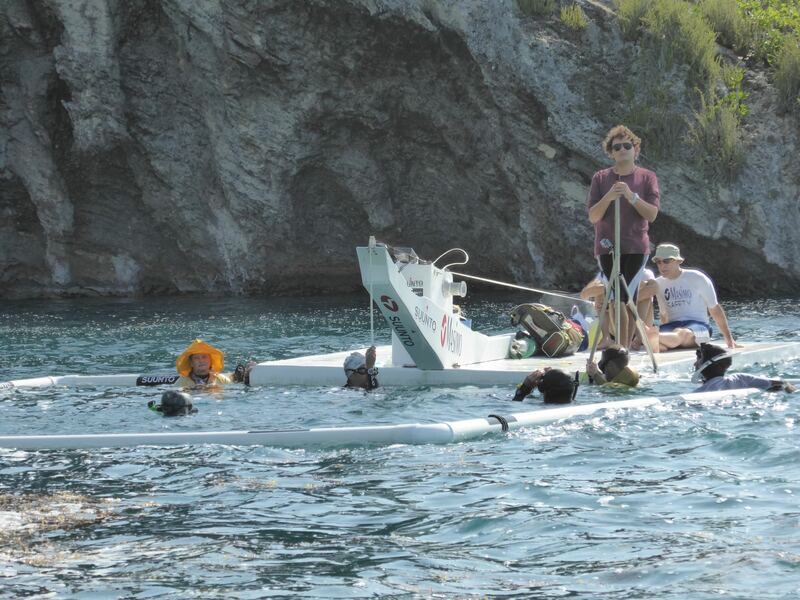 The dives are scheduled about ten minutes apart, the diver’s aspired depth and time pre-announced. They suit up, progress to the preparatory platform a few meters from the dive site; execute their dive; emerge to be authenticated (or not), congratulated (or carded), and if necessary oxygenated; return to shore, and on a personal sense of the opportune unsuit and join the community as observers. Meanwhile, Sam Trubridge calls the time from the dive platform. Here in the Bahamas, as I quickly experienced, time is mutable: you’re told to arrive two hours ahead of your flight time yet wait an additional 45 minutes, but this doesn’t mean the plane is late. Nothing is ever confessedly late, or busy, or quiet. There seems to be tacit agreement about this. But the time that Sam calls cannot be gainsayed. Everyone’s rhythm is set by Sam’s countdowns. And when the diver flips and begins their descent a new set of times, interpolated with distances, begins. Sam reads the sonar and a watch. Depending on what the diver specified as their goal we know whether they are on track. When the diver reemerges from today’s much-stirred and murky Atlantic water, and performs specified acts signifying health and mental composure, the judges determine whether the dive was successful or has demerits. 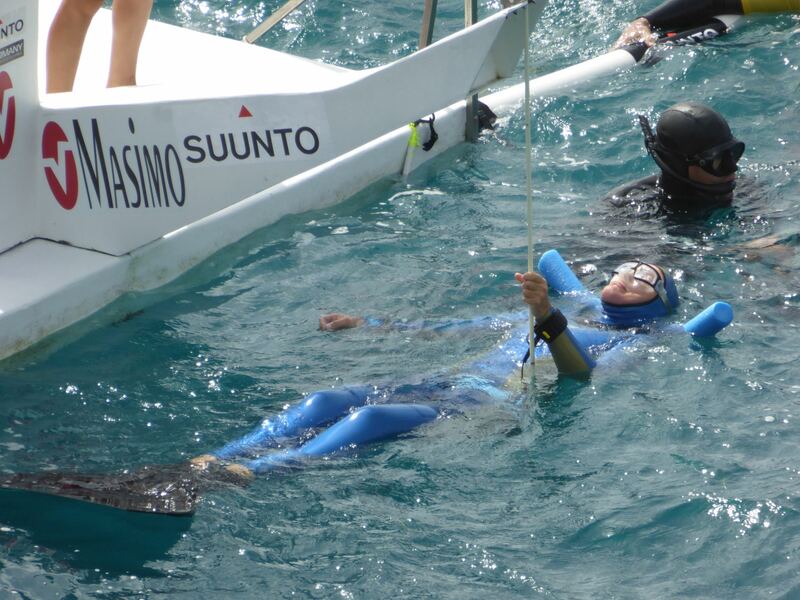 The safety divers who have accompanied them on the last 35 meters of the ascent kibbitz and gracefully float in the pen. Here, there is a single identity—freediver—each marked by allegiance to a political entity (a nation). Divers compete against themselves, many striving to set personal bests in the various disciplines, but they also compete on behalf of a nation. I wonder if their legislatures, sports ministries, or national media know they exist? Do they even know this sport exists? How does a pursuit, made technical, then codified and internationally regulated, become a sport? The cameras are particularly noticeable at the dive site—at the water line and below—though thanks to telephoto lenses they are also on the cliffs above and at the shoreline. Professionals and amateurs document assiduously. The spatial arrangement is conducive to this: within the diving pen room is made not only for the safety divers but also photographers; the platform squarely faces the cliff with the accessible aspect; and even at the shore’s edge there is a devoted professional photographer who tries to capture the emotions exhibited by divers when they emerge from the water and make their way to shore. A limited range of angles of view is exploited over and over in the iterations of dives. Each one (the descent, the emergence, checking for lucidity, and the aftermath that could be interventionist or gently triumphant) develops a codified style recombinant into a narrative with limited variability. This mise en scène (literally, putting into the scene) is notable not just because it creates documentation but because, in a sense, good documentation will promulgate the aim of publicizing, proliferating, and recruiting to the pursuit of freediving. In cinematography, the mise en scène constitutes everything before the camera. It is the culmination of all departments (costume, make-up, set dressing, lighting) choreographed in a shot as captured by a camera. In theatre, where the term originated, the mise en scène also constitutes the input of all visual elements as well as the pattern of movement undertaken by actors (and, for example, lighting); in contrast to a script, which is merely the blueprint for performance, a mise en scène is the entirety of the realized performance. Whereas Erving Goffman would classify the dive site as the stage and everything else as backstage, what I argue is the mise en scène encompasses both. At Dean’s Blue Hole, the theatrical mise en scène is not limited to what is framed by a lens, or even what is designated as athletic performance, but extends to the entirety of the activity at Turtle Bay. At Deep Blue this distinction between cinematographic and theatrical mise en scène matters, for the on-camera action is only one facet of the entire undertaking. I struggle to describe the mise en scène of a dive because apart from the flip to descend, the reemergence, and regulation checks the performance per se is invisible. The underwater cameras don’t even capture most of it, especially for the more ambitious depths. But thinking about this formalist compositional problem as a theatre scholar (rather than a filmic challenge) brings me to an insight about the totality of the event: it is perpendicular to the dives’ axis and so I call it Horizontal Blue. 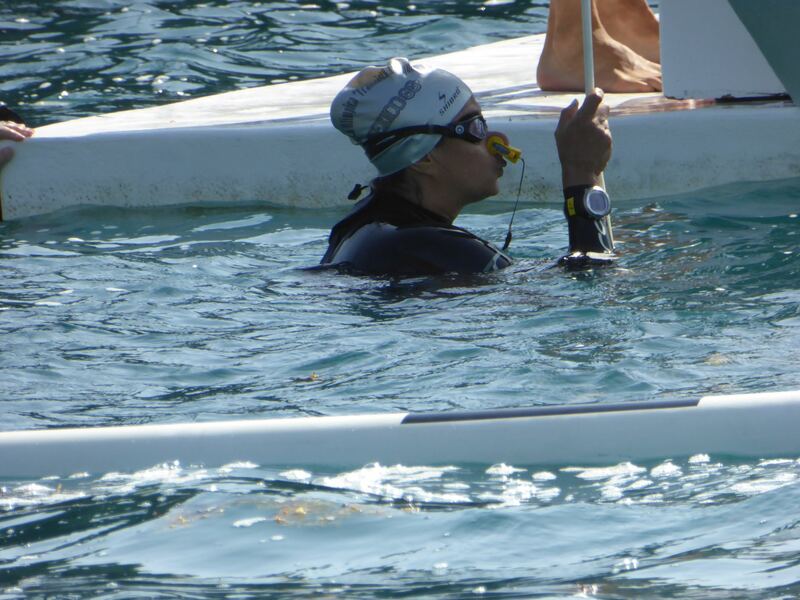 A concurrent but also future-oriented focus on the physiological monitoring of divers (this includes the Masimo corporation’s sponsorship of oximeter readings pre/post dive). 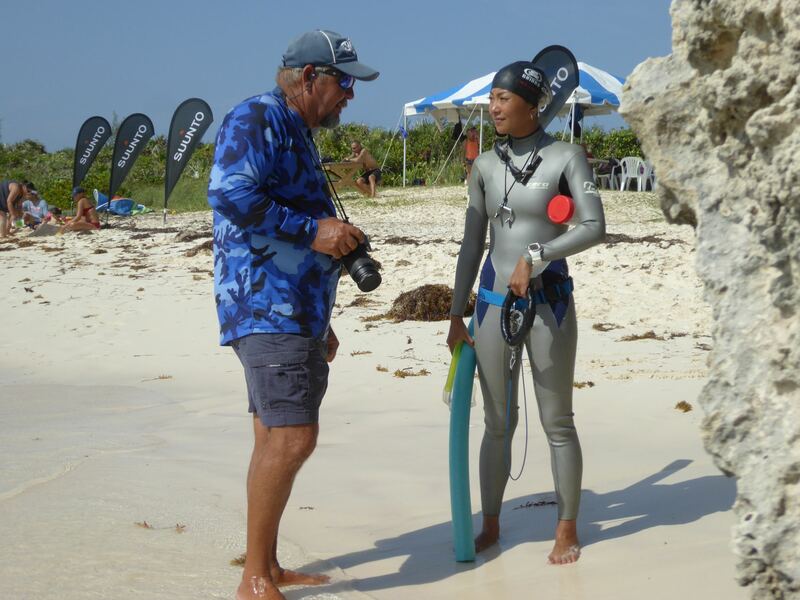 Less conspicuously, Dr. Juan Martin Valdivia Valdivia, a neurosurgeon volunteering at the site, examines some divers for neurological issues and considers how to advise AIDA on the implementation of protocols. There is an overt narrative about increasing the safety of freediving, and this feeds into it. For some critics, Diomedes’ aristeia is in battle, but for me it is this statement that shows his great wisdom. Rather than seeking solitary valour, he takes the collective approach, finding greater strength and cunning in comradeship. The virtuoso/a is another ancient concept embodying power, strength, and moral goodness. Additionally, the virtuoso/a has extraordinary technical skill, and hence we associate this term particularly with musicianship. Other artists and artisans can qualify, but differentiating between the prowess of the virtuoso/a and the lesser mortal is a helpful way to contrast the accomplishments of aristeia from other, lesser, deeds. Music’s quality of sound is dependent not merely on the instrument but also in how it is wielded. Muscular control of the diaphragm, chest walls, throat, jaw, and face determine how breath is collected, held, and expelled on notes. The ear, of course, is important but its discernment and calibration is a matter of mind as well as ottic acuity. The virtuoso/a is also a master of coordination: for instrumentalists this means the hands but they are connected to arms and shoulders that must have the optimal relaxation, poise, and grace in the midst of exertion and precision. In ensembles the musician coordinates with others but takes ultimate responsibility for their improvisation within the fluid discipline of concerted sound-making. And in all cases awareness of how the sound resonates in a locale, is effected by the presence of absorbent and non-absorbent surfaces, remains tempered to pitch, and so requires ongoing adjustment is a matter of discernment but also the ability to activate infinite adjustments while playing. But virtuosi too find greater resourcefulness in company, relying continually on teachers and coaches to temper their approach. In a sense, they go into their aristeia always with the fuller resource of this companionship. By accepting your fate (ishvarapranidhana), you achieve self knowledge (samadhi) and supernatural power (siddhi). The key to success in this regard is practice with effort, which becomes progressively easier, combined with deep contemplation (samapatti). Certainly, a reckoning with duality is necessary. As an instructor of the Eskimo Roll once told me, “water is a low-oxygen environment.” But freediving is more profound and agential than dodging a rock or righting a kayak after a watery broadside: it requires not just righting oneself without the panic of a push-out, but takes a sustained will over many minutes that requires calibrated physical and mental adjustments at specific depths on the descent and ascent. Without these the consequences are more than a dousing and sputter. At a certain depth gravity takes a body downward and the mind must remember not only when and how to turn to return, but also to collect the patch velcroed to the line at the diver’s pre-selected depth. Some divers say that this epitomizes freedom. They must be right, because only they could know, though this is not all I perceive in the ontology of this pursuit. Freedom is not commensurate with agency. And agency is not commensurate with technical ability. The divers must free themselves, to be sure, through self-knowledge that releases them from fear. They practice with effort, they execute with effort, and though this eases and naturalizes with repetition it is always an exertion of some facet of their virtuosic apparatus such as body, mind, or sattva (lightness or clarity). When William Trubridge arose from his 120-meter dive his tanned face was ash-coloured: the blood had pooled to the core and the brain in a mammalian survival instinct, and specific kinds of breath were requisite to expel the pallour. His coach said: “Hook, William, hook!” And he hooked. The ability to execute the physical act of diving and return in optimal sequence, infinitely calibrated to the circumstances, is the virtuosity of this pursuit. Like Diomedes, divers strive for honour and glory but must not succumb to madness or hubris. Barber Professor of Performing Arts and Associate Dean for Academic Affairs in The Graduate School at Northwestern University (Evanston, IL USA). Davis’ work ranges across historical and contemporary issues, particularly the implicit theory that operates through social, juridicial, political, or mediatized practices (for example, how acting theory enables survival for federally protected witnesses under Witsec; how theatricality clarifies the analytical realizations of spectators in quotidian or spectacular interactions; why the distinctions between artistic spectating and political advocacy are a false binary of aesthetics and rhetoric; and the ontologies of performance and rehearsal in the high-stakes disaster preparation for the aftermath of nuclear war). Popular conceptions of performance and the utilization of performance lexicons to account for reception frame several research projects, especially around practices of “covert” or “sub rosa” performance (persona, preparation, self-fashioning), thresholds into performance (rehearsal, everyday consciousness, perceptibility), and the possession and exhibition of technical skill (by artists, citizens, or others). Tracy C. Davis is series editor for Cambridge University Press’s Cambridge Studies in Theatre and Performance Theory. A Visiting Correspondent conducts a research residency and creatively responds to academic/artistic programs unfolding in a Fluid States event. They will capture, critique and expand the contribution of the PSi#21 Fluid States through the lens of their own research agendas, and their response to the place, the activities, and the conversations unfolding during the activities. Their contributions, and their textual, visual, sonic, video or other interventions will become a critical component of PSi#21 Fluid States, navigating the topics and the terrain for a global audience, and, where there is interest in pursuing it, their contributions may also become part of PSi publications – e.g. journal issues – coming out of PSi#21 Fluid States. A part of the programme for Deep Anatomy – a regional cluster for Performance Studies International #21 globally dispersed conference on Long Island, The Bahamas, April 26-May10, 2015.